I wanted to like this book. I really did. I have really enjoyed all of the other books in this series, but this one just didn't meet up to my expectations. For starters, the cover makes it look as if this is a Christmas book, but it really isn't. Then comes the character of Thea. For whatever reason, I just didn't like her. She seemed spoiled and whiney to me. I don't know. Perhaps the problem isn't with the book but with the expectations that I had for the book. I was expecting romance and there wasn't any. Instead, this book is a basic amateur sleuth whodunit type book. The story itself moves along quickly, but in the end, it just wasn't enough to hold my attention. If there was one redeeming quality to me, it was the character of Mary-Alice. I very much adored her and would love to read a book about her history and the love of her life, who clearly meant so much to her. 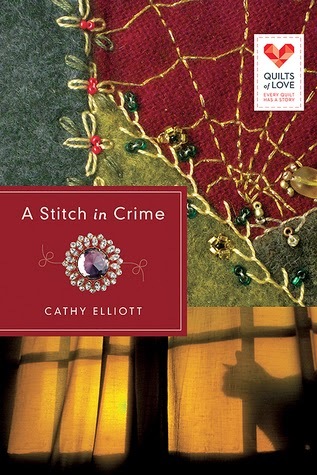 All of this being said, if you're looking for an amateur sleuth meets quilting and a serious love for her cat type of book, be sure to check this one out. Just because it wasn't my favorite doesn't mean that it can't be yours!